Newest pictures are at the top of the page, the further down you look, the younger the pups. This litter is now ready to go home. Here are the final pictures. Below that you will find a couple of group pictures and some blooper shots. Benny is his new name. He will travel to Powell, Ohio to live with Jeff and family. Fergus is going to go live with Kim in Westerville, Ohio. Last but not least, say hello to Maisie. WARNING, HUGE UPDATE, PLEASE LET ALL PICTURES LOAD! Introducing Molly and Dewey's November 30th 2017 litter of 8. In this litter we have 2 black boys, 2 black girls, 1 wheaten girl and 3 wheaten boys. I am placing these pups to folks on my waiting list. Prices, terms, email address and phone number are located here. 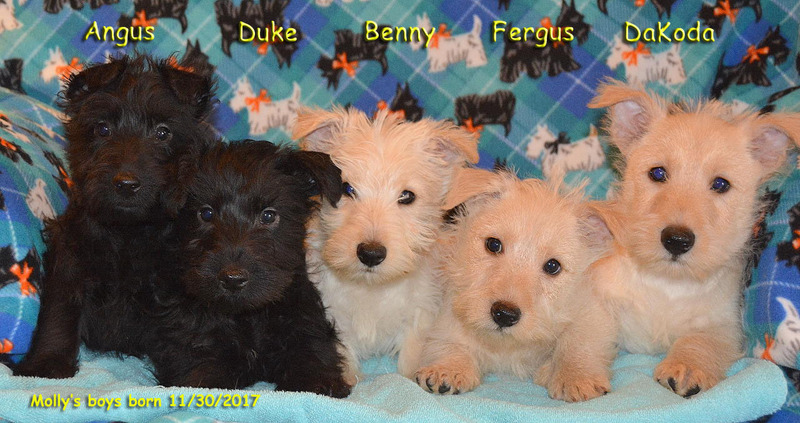 This litter can go home on SATURDAY FEBRUARY 10th. They are 45 days old in these pictures. 1st inoculations and vet check happen later this week, pups have been wormed and everyone is 100% weaned away from Mama. Each puppy has a new ID collar. This collar will stay with your puppy until the day you come to take him or her home. FOR THIS LITTER: The GIRLS are in RED, the BOYS are in GREEN. She's the life of the party. Very happy go lucky. She's the runt of the litter but don't tell her that because she's always the 1st to the food bowl. She's a bit unsure at 1st but quickly jumps to action when she is sure the coast is clear. She's very calm and a bit reserved. Very jolly and curious about everything. He's another very happy boy and he's very speedy too! He's the reddest boy, he's not as ornery as his wheaten brothers. He's more of an explorer. A bit reserved and more of a snuggler than a wild child. The highlights you see are not brindle, it's the reflection of the light. He's black. Very similar in personality to his brother above. He is black with a small tuft of maybe 6 white hairs on his chest, this will probably disappear when he grows up. Please check us out on Facebook for some BONUS pictures of these puppies! Please check back in about 3 weeks for a final update.